Via this article I stumbled onto this dissertation which promotes using comics in educational contexts (a topic I am very interested in). In one of the chapters of the thesis, it looks at the understanding of comics and includes a "neuroscience" section. Now, even when I disagree with them, I am always one to encourage research and writing on the structure and comprehension of comics (and I am wholly in support of the effort that this thesis is trying to make with regard to graphic textbooks). However, I have also railed on the invocation of neuroscience when used inappropriately. 1) It suffers from the "localization" fallacy. 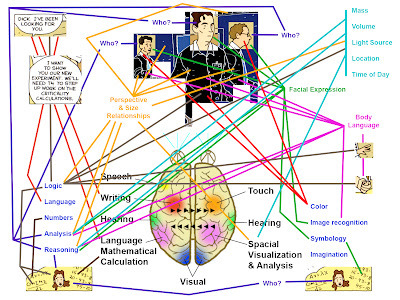 Contrary to what the image implies, there is not a "speech" location in the brain. Nor is there a "writing" or "vision" location in the brain. The brain does not localize full behaviors in the brain in modular locations. Rather, the brain is highly interconnected, with portions of the brain devoted to particular functions that interface to produce complex behaviors like speech, language, or vision. 2) Discussing the brain is entirely unnecessary in a thesis like this. The overall point that this thesis is trying to make is that comics are very complex and involve numerous interacting parts that we understand almost effortlessly. This point does not rely on discussion of the brain to come across. In fact, I myself have done quite a lot of work describing the complexity of structure found in comics, some of which discusses the brain, and some does not. 3) If you're going to talk about comics and the brain, at least do the basic research to discuss what work has actually been done on this topic. Granted, there are a limited number of studies that have directly examined this issue. However, they are out there, and reviews of some of these papers can be found on this very blog: Here, here, here, and here. I myself have now done three studies looking at comics and the brain. I'm currently writing up my latest two studies (which were my dissertation), but my first experiment is online here: Full pdf article, Short "comic" version. FYI, Martha Farah and Cayce Hook had a recent CDIPS article casting doubt on the "seductive allure" of brain images. 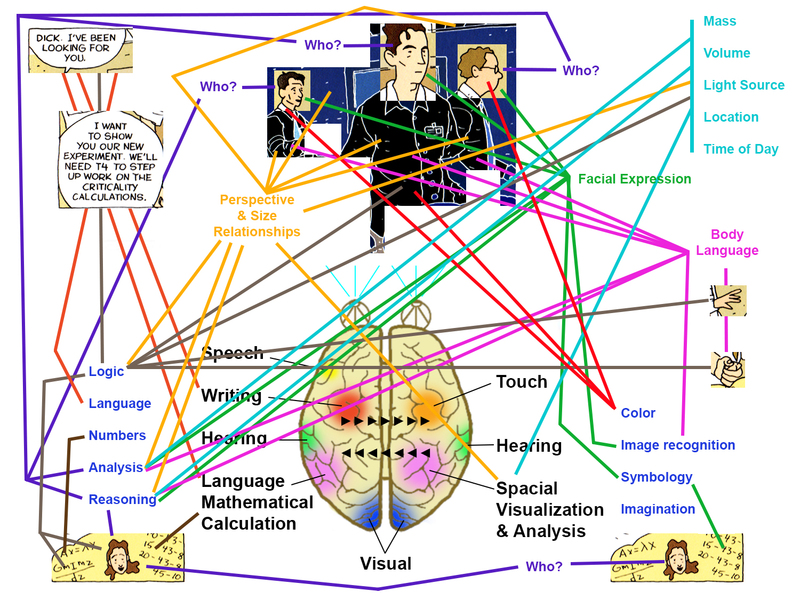 I agree that people talk about the brain too much in contexts where it doesn't provide any extra information, and this seems to be one of them (and is uniquely horrible and incomprehensible just as a piece of scientific visualization, forgetting about the brain thing). But it seems like this particular bit of received wisdom is on shaky empirical ground. Thanks for the comment Matt! I appreciate the link to the newer study—it should be an interesting read.